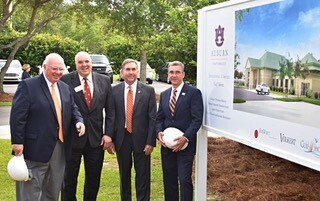 From left, Dr. Tim Boosinger, Dr. Gary Lemme, CVM Dean Calvin Johnson, Dr. William Hutto Jr.
Auburn University and the City of Gulf Shores broke ground on a complex that will serve as an educational outpost for the university and a resource for the gulf coast. The College of Veterinary Medicine’s referral center will be the centerpiece of the 24,000-square-foot Auburn University Educational Complex which will provide specialty and after-hours veterinary services and educational opportunities for students interested in internal medicine and surgery. Other Auburn programs included in the complex include the Auburn Aviation Center, the Alabama Cooperative Extension System and the Office of the Vice President for Research and Economic Development. “As an institution, Auburn will continue working with public and private partners to help drive the state’s economy and provide the research and knowledge that will enhance residents’ quality of life. This new educational complex is an excellent example of collaboration and provides a model for the type of partnership that serves us all,” said Auburn University President Steven Leath. “I am excited and confident about this unique expansion of our program,” said Dean Calvin Johnson. “The center will provide extensive educational opportunities for Auburn students interested in specializing in internal medicine and surgery. AU College of Veterinary faculty and administrators pose for the groundbreaking ceremony. Shown from left, Drs. John Hatchcock, Jamie Bellah, Phillip Moore, Robert Kennis, Dan Givens, Dean Calvin Johnson, Kristina Photakis, Cathy Antee, Ashley Burt. “Auburn University’s Veterinary Teaching Hospital has long served as a referral center for veterinarians practicing in south Alabama and west Florida,” Dean Johnson said. “It will be permanently staffed with Auburn University veterinarians, technicians, and office personnel. “Establishing the Auburn University Educational Complex in Gulf Shores advances our institution’s mission by providing educational opportunities and services that are not only mutually beneficial, but also impactful,” said Auburn University Provost Timothy Boosinger. The City of Gulf Shores announced in 2014 a strategic plan called “Small Town, Big Beach Vision 2025 for Sustainability” that included plans for the Coastal Alabama Center for Educational Excellence, an academic campus with a new high school and a new location for Faulkner State Community College. The Auburn University Educational Complex will help meet the needs of the strategic plan by offering educational and economic development resources for the community, strengthening the region’s ability to serve its citizens. “Auburn University’s investment in our community validates our vision of enhancing education at all levels, and today’s groundbreaking marks a significant step toward turning this vision into reality,” said Gulf Shores Mayor Robert Craft. The Auburn University Educational Facility will be located at 21656 County Road 8 in Gulf Shores, which is at the corner of the Beach Express and County Road 8, adjacent to land acquired by the City of Gulf Shores for a new high school and the planned Coastal Alabama Center for Educational Excellence.